Need an easy, filling, one-pot meal that is ready in less than 30 minutes? I know as a working mom I need all the help I can get in the kitchen. 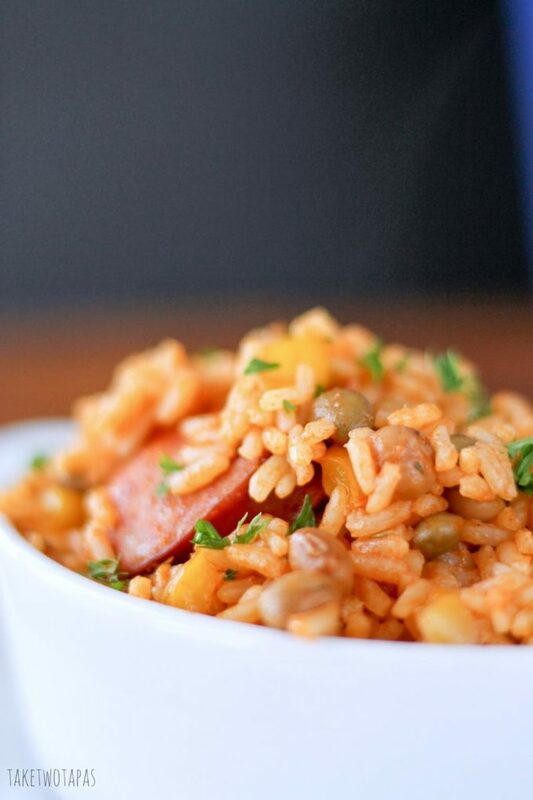 This one-pot Bahamian Peas and Rice dish combines smoked sausage, pigeon peas, rice, and veggies! Being a mother of two boys is hard work. 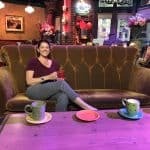 Throw in a husband that travels most days of the week, and I am just about frazzled every night. Trying to think of easy, yet hearty, recipes to keep my boys full is a job all by itself. This peas and rice pot with smoked sausage is a great one to add to your menu rotation! My younger son is still in that pop tart, pretzel, plain pasta, canned soup, and chicken finger phase. I can’t get him to try anything new. My older son is really starting to spread his wings and try new things. One place I can get him to try new dishes is when we visit my grandfather’s old home in the Bahamas. He was born, along with his four sisters, on the island of Green Turtle Cay, in the Abacos part of the Bahamas. It is a tiny island, but full of history. I had the privilege to spend my summers there as a child, visiting my grandparents and all their cousins, catching fresh fish, and making homemade coconut ice cream. My grandfather Curtis and two of his sisters: Cynthia and Beverly. That’s me in the red! 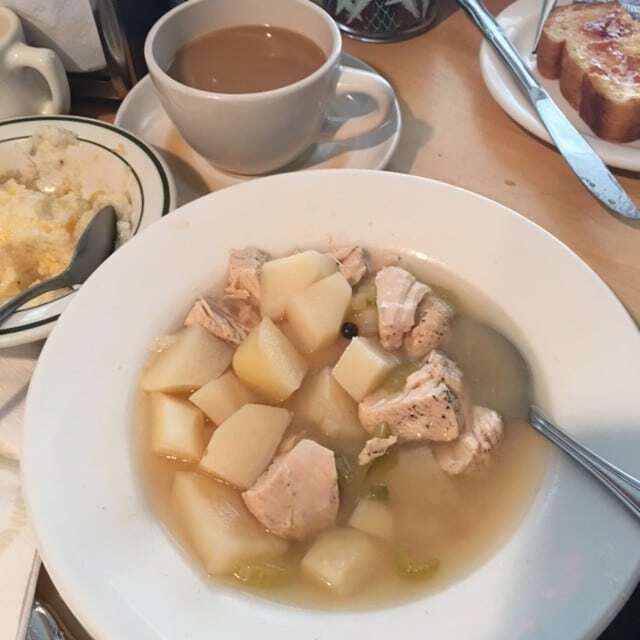 This souse chicken is made with potatoes, lime juice, allspice, and hot peppers and is standard breakfast in the islands. They have a macaroni and cheese that will blow your mind, but today I am going to share with you the “peas and rice” dish. The peas in the “Peas and Rice” dish are pigeon peas or “gandules.” The rice is toasted in the pan with bacon and sweet peppers. Adding a bit of tomato paste adds some depth and a gorgeous red/orange color. The peas are added along with the broth or water and some thyme for its floral notes and cooked like regular rice. Once the 20 minutes are up, you uncover this gorgeous pot of rice, peas, peppers, you are ready for a filling meal full of flavor! Peas and rice is typically a side dish, but today I am adding some Hillshire Farm smoked sausage and making this a complete meal! The bit of bacon you add in the beginning to soften the onion and peppers adds a hint of smokiness, but I wanted to accentuate that flavor and add some more protein to this dish to make it a full meal for other busy parents to enjoy. Look at how gorgeous that looks! Can you believe you can get this in less than 30 minutes? Because the Hillshire Farm Smoked Sausage that I picked up is already cooked, it shortens the cook time to the amount of time it takes to cook rice and saute the peppers and onions. 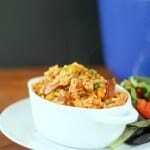 And it really adds a depth of flavor to the staple pigeon peas and rice. 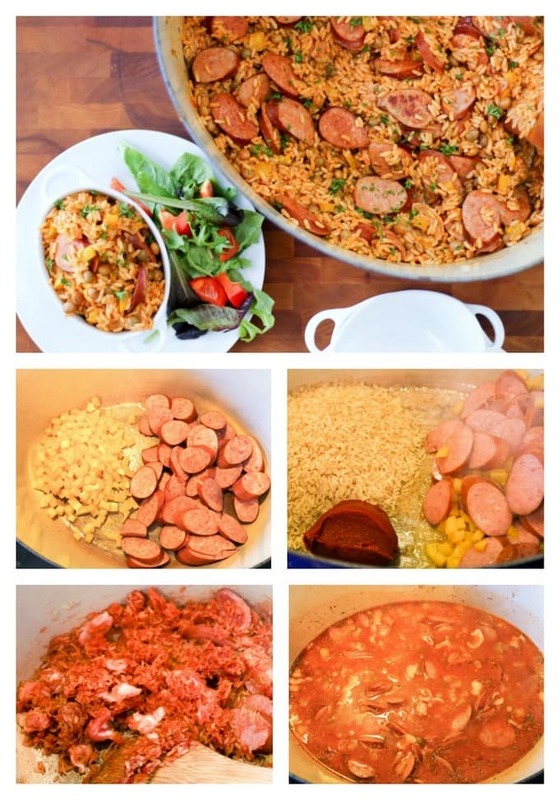 This Bahamian Peas and Rice with Smoked Sausage is a great dinner because it is 30 minutes and it is ONE POT! Check out my Butternut Squash soup for a great vegetarian one-pot meal that serves a lot of people for little money! Need an easy, filling, one-pot meal that is ready in less than 30 minutes? I know as a working mom I need all the help I can get in the kitchen. 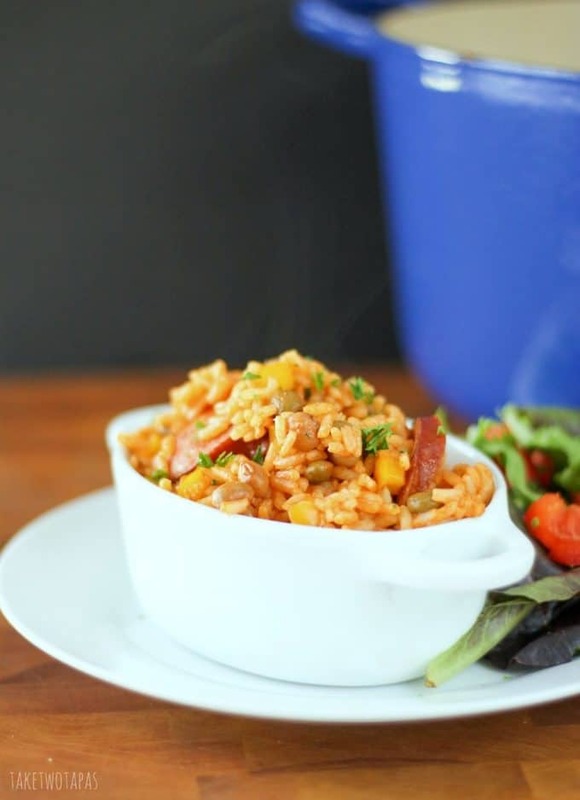 This easy recipe for a one-pot dish combines smoked sausage, pigeon peas, rice, and veggies with a hint of Bahamian flair! Place your large pot on the stove and turn on medium heat. Add the olive oil to get it hot. Add the onion, pepper, bacon, and sausage to the pot. Cook until the bacon releases some of its fat and the peppers and onions are almost tender. Move all of this to one side of the pot. On the other side, add the rice and tomato paste. Stir the paste into the rice and coat it, keeping it separate from the sausage and veggies. Let cook for about 30 seconds and start to toast. Stir the rice, paste, and sausage mixture all together to combine. Add the pigeon peas and the thyme, making sure you rub the thyme in your hands to release the oils. Reduce temperature to low and cover tightly. Serve warm, by itself, or with a salad! Making this dish at home reminds me of all the times I sat in my grandparent’s kitchen, smelling the rice toasting, and the fish frying next to it. The fish we would have caught on the boat that day, and that night I would be enjoying the fruits of my labor with my sunburnt cheeks and some sand still between my toes. I am very lucky to still be able to share these memories with my kids and let them make their own memories, right on this very beach. In the meantime, back at home and in the middle of a busy week of school and tennis practice, I can make this Smoked Sausage Peas and Rice dish, we can talk about how many fish we are going to catch and which cousins they might be taller than when we go back next summer. Thanks for letting me know I forgot to add it to the list. It is 4 cups of water or broth. I hope you love it as much as I do! Thanks for reading! MMMmmmmm, this looks and sounds so fabulous. Healthy and fairly easy to make too! I have to whip this up for the family sometime soon. You might have some for lunch the next day! This sounds like a delicious recipe idea. I love that it only takes 30 minutes too. With 5 boys and a girl (4 of them are all teenagers who workout in the gym 4-5 days a week) they sure can eat now!! How lucky you are to have a family home in the Bahamas, I’m sure you’re family will make many memories there. I am sharing this recipe with my viewers. Thank you so much for sharing on Inspire Me Monday. I hope you have a blessed week. Looks delicious! Thanks for sharing on the “What’s for Dinner” link up! This looks like the best bowl of comfort food I could ask for right now! Love that it is made in one pot! Makes clean up a whole lot easier! I love sausage and rice, it’s not a common food in middle east and that’s why I love it so much it just seems like a perfect combination to me! Jennifer, this meal would be so pleasing to my entire family!! Plus there is plenty for leftovers! This looks like a perfect bowl for a filling, delicious meal! Thanks for sharing! Thanks Amanda! I hope to get some fresh shots when I go back! Love the Bahamas story! Almost a year ago my husband and I spent our 10th anniversary in Exuma, it was so beautiful! This recipe sounds great too, I love hearty meals like this! How wonderful that you have such great family memories that you’re able to share with your kids! Love it, and I’m sure they’ll remember their visits fondly! What a great way to make a tasty, filling meal (love the short prep time, too)! Bet the flavors combine so nicely together! The pigeon peas have a distinct flavor al their own which is great! 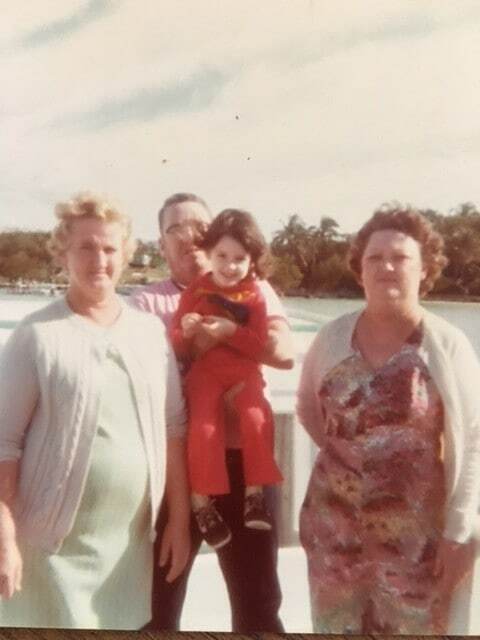 What a fantastic post – childhood memories are the best – especially when they involve dear, dear Grandparents. I have to say I like this dish. It’s quick & simple, tempting to look at and substantial. My one request – do you have the recipe for the homemade coconut ice cream for our dessert? Pretty please! I will get it for you! This dish looks sooooo good, adding smoked sausage just takes it from an awesome side dish to an even more awesome main! Yum! And I love that photo of you with your grandfather and his sisters! Thanks! You can serve it as tapas for a large group or a whole meal for the family! One-Pot meals are the best! 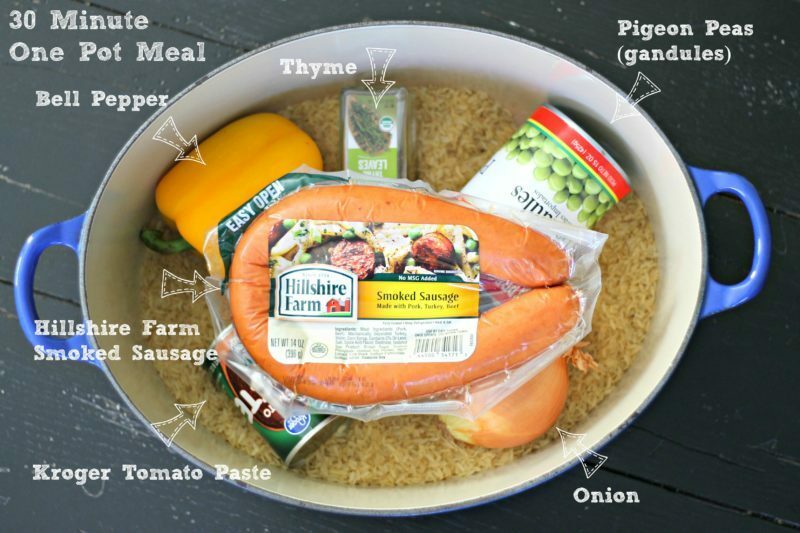 So great for busy weeknights, and this sausage and rice combo looks so flavorful and delicious! Right?!? And there are leftovers for lunch the next day! Who doesn’t need an easy 30 minute meal? This one looks fantastic and so full of flavor! This looks like a hearty but not heavy dish and best of all, absolutely delicious! See? I love this. That soup looks great, too. I was meant to live on an island, I think. Except I can’t handle the sun. Hmmm….maybe I just need to eat like I live on an island. Delish recipe, Jen. You can certainly sit in front a great screen saver and eat this. Maybe a palm tree or two? 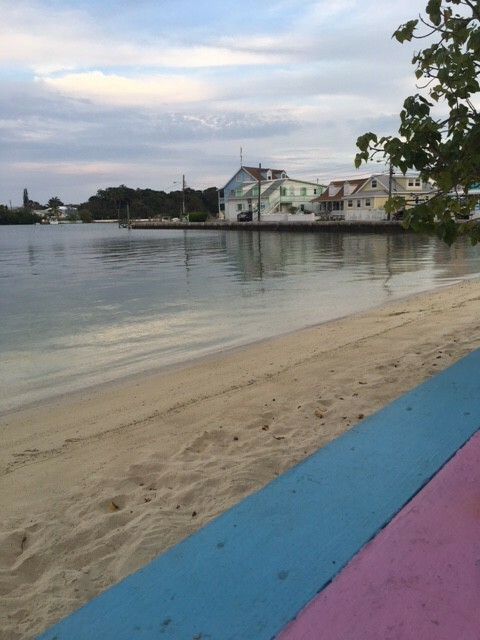 I would love to take you with me next trip and make you some fresh conch salad!